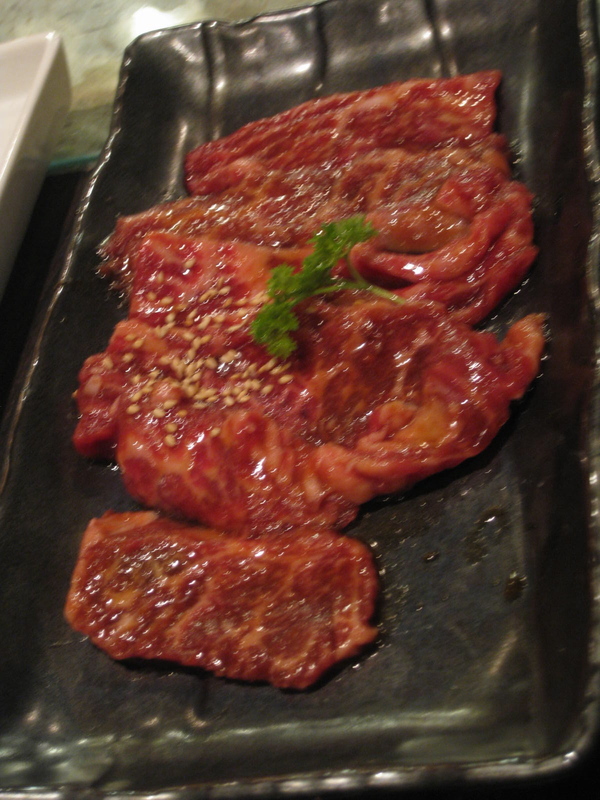 I had a really nice dinner a few weeks ago at Gyu-Kaku in the East Village. My friends and I used a Village Vines 30% off coupon to make the reservation for a Thursday night. We started off with the tuna volcano, spicy tuna on rice cracker balls $7. There was a nice kick to the tuna, definitely not too spicy. Kimchee Bibimbap $11. The server helped us split the rice into 3 portions. (This was 1 of the 3 portions). The kimchee wasn't spicy enough! Kalbi Short Rib $9. All the meats seemed to be seasoned quite similarly, but they were all very tender. Duck $10. SO tender and delicious. Green tea mille crepes with vanilla ice cream $9. This was probably the most reasonable sized dish of the entire meal. Tasted fresh and had a strong green tea flavor. We also ordered a mushroom medley ($6) to grill. It was bland and kind of forgettable; I didn't even bother taking a picture of it. I really liked the food but the portions were just a tad too small. All of us got hungry later in the night. I guess the plus side of having such small portions is that you can try more dishes and get that variety, but it's not cheap! I still want to try the happy hour here because it sounds like a great deal, Mon-Thurs 5:00-6:00pm, 9:30pm-closing, and Fri & Sat 3:00-6:00pm, several appetizers and meats are 50% off. Happy hour menu here. Without a discount though, I probably wouldn't eat here again. I will probably stick to Shabu-Tatsu instead.